Whether you live in Arizona or New Mexico or are just passing through you should grab a copy of this book. 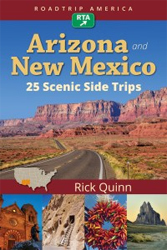 The book features 25 Scenic Side Trips. The book is filled with awesome pictures and maps, and recommended alternate routes. The Alternate routes are great, you really do not get to see much from an interstate, side rides are the way to go. The book even tells you how much extra time it will take to travel through via one of the side trips, makes it easy to adjust your travel time. Some of these side trips can take you just a few minutes out of your way. There are all kinds of side trips if you are into geology, Native American sites, the desert and so much more. And best of all most of them only cost you a few minutes of time and little bit of gas. Excellent book I wish there was a book like this for Florida where I live. I have lived her about 25 years and have explored a lot but I know there are so many things left to see. So if you live in Arizona or New Mexico even if you have lived there your whole life I would suggest you grab a copy and hit the road.